There are many misleading facts in this article and some completely untrue. Im fed up of ignorant people giving out about what they dont understand nor are willing to listen too or research properly. The world is running out of fossil fuels and if you still want to be able to power your shower, fridge, TV, heating. You will need some other form of electricity. One preferably that wont run out or cost an arm and a leg. In this article i see no mention of fuel costs? Why? This comment being from someone who knows a little about the situation. A second year Electrical Engineering student. 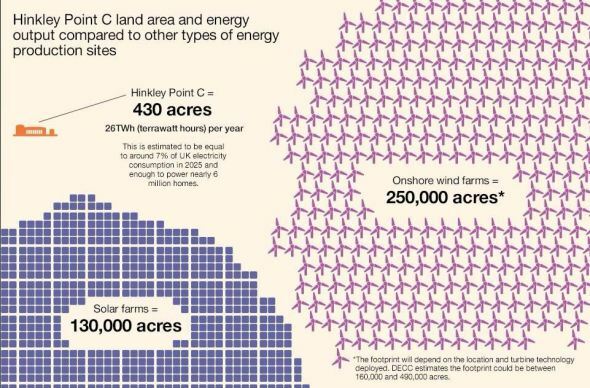 If you want energy to cost ‘an arm and a leg’, then renewables are your answer. 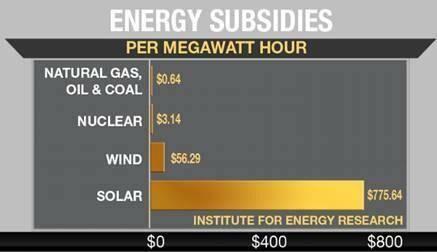 Renewable energy is a $250 billion dollar industry that makes about 3% of our electricity. 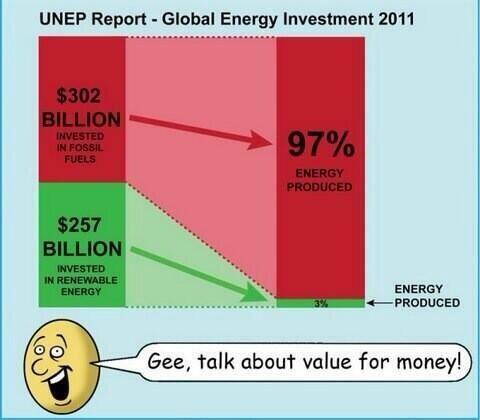 Fossils Fuels are a $300 billion dollar industry that make up the other 97%. Fusion is the future. All materials required are found in sea water. Why is it detractors always pile in and say an article is rubbish then totally fail to point out where – meaning it is just a knee jerk dogmatic reaction and not an argument defence at all. Solar and wind are unreliable – fact. 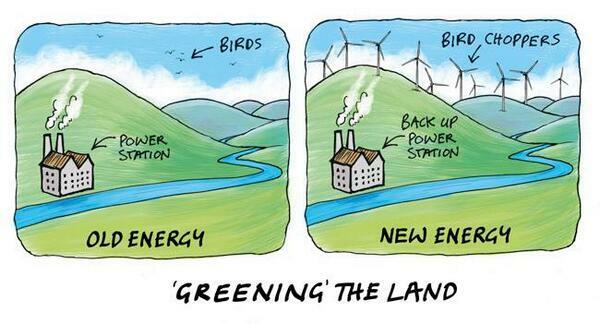 Turbines do not work when the wind is too low or too high (in the latter case in the UK we pay THREE TIMES the generation rate when they are not producing). Solar doesn’t work at night (except in Spain where they connected diesel generators to the outflow so they could claim the huge tariffs and were only caught out when a Govt official noticed they produced energy 24×7), is much less efficient during cloudy days and pretty useless when the panels are covered in snow (so that’s winter taken care of, when we need energy more than any other time and a dump of snow followed by a large high pressure and freezing temperatures leaves us, quite literally, powerless). What gets me about AGW theory (which it still is by the way, not a physical law) is that it doesn’t pass the common sense test. If you are demonstrating gravity – hardly an uncomplicated subject – the test is straightforward: hold a ball in the air, let go, if it falls it meets the theory otherwise the observer says to go back to the drawing board. If it goes sideways do you chase after them telling them they are just scientifically illiterate and it went sideways because of some special effect in place at that time? No, you set up a condition that invalidates the theory if it occurs, and in that way the absence of that condition intensifies your reliance on that theory. So with global warming, you first had to change the name to climate change when the globe stopped warming, but the worst part of it is the total inability to demonstrate it to the man in the street to meet the common sense test: what weather do you see that proves the effect is happening at all? Getting warmer – aha – there you go that proves it. Er, record cold, well it’s climate change and unusual so that fits the theory. Floods – aha – warmer world is wetter so there you go. Droughts, well, yeah, climate change you see – it’s different so it MUST be the cause. Record snow, floods AND cold so that fits! More storms – aha – see told you! Record time gap since US lat hit by major Hurricane – well that’s a circulation change so that fits. Jet steam shift – climate change caused by stronger trade winds in pacific, except when it’s caused by weaker trade winds in pacific. Not a single weather phenomenon that happens outside a partly cloudy day with light winds, a light shower, and a temperature of 15 deg C – so the ‘average’ for the whole planet – can be used to falsify the theory because they have all been claimed by climate change. All of this just to prove that an extreme (as in never happened before) climatic condition is occurring at all, none of it any indication of the actual cause. Yet we demand a trillion dollars we don’t have is spent to do something about it or we definitely have no future. At this point the person in the street looks at you like you’re a nutball and turns away…. and you chase after them and remind them they are not a climate scientist…. The essence of a scientific theory is that it can be refuted. ‘Global Warming’ can be refuted with facts i.e. the past 17 year warming standstill. If a theory can’t be refuted, it becomes a religion. The new name ‘Climate Change’ cannot be refuted, because the climate always changes, and hot or cold can be used as evidence, therefore the theory is unfalsifiable, therefore it is a religion. If it proves everything, it proves nothing. You have the brains then. Keep studying & you may see the light. Germany every year wastes 24B€ to subsidy renewable electricity (representing only 13% of the total and it is clear that they cannot utileze the entire output, like Denmark which pains to utilize more than 35%, the balance shall be thrown to exports…). To make the same amouint of CO² free electricity, Germany would have only to invest in 4 new 1500MW nuclear plants, costing all together 24B€, only once in 60years. Where are the famous idiots? There is not one single calculation provided to support this assertion…in fact, there appears to be very few calculations and a lack of recognition for the proper sources. Like I say, you don’t care about facts, and now you are about to reply to me instead of doing something to save the poor, you don’t care about the poor either. 2. Rather minor detail needing calculations to prove RE’s would need to use their own energy to power batts….if man could even invent them, without becoming further cost prohibitive and …… further harming the “poor”. 3. Renewable energy harms the poor and keeps 1.3 billion people in grinding poverty. 4. Advocating cheap, efficient, reliable energy (fossil fuels) versus expensive, unreliable energy (wind/solar)…as I do, can only help “the poor”. I agree, I was just letting you know that Chris Barron was belittling your work at the link I posted. Thought you might want to defend yourself. Ha. Gotcha. …or got me! Cheers Gator.